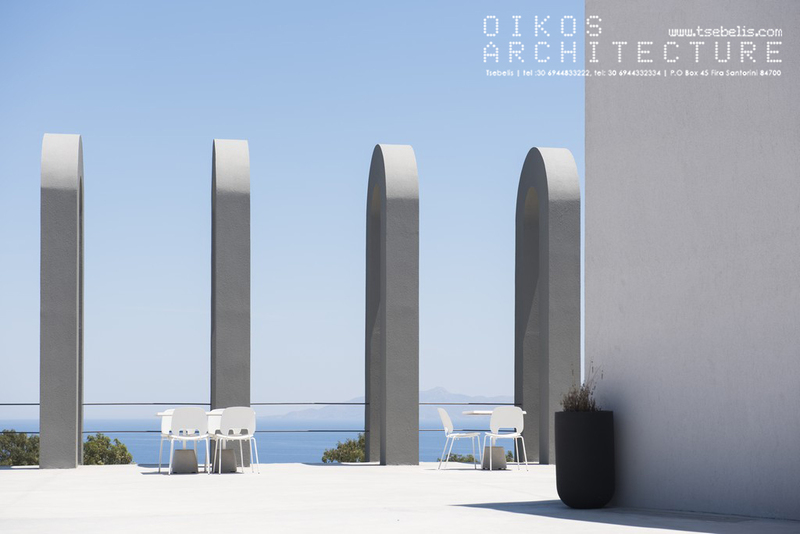 An iconic example of a space built respecting the natural setting, a smooth interaction in between the four elements of nature (fire, water, earth, air) according to ancient philosophy. 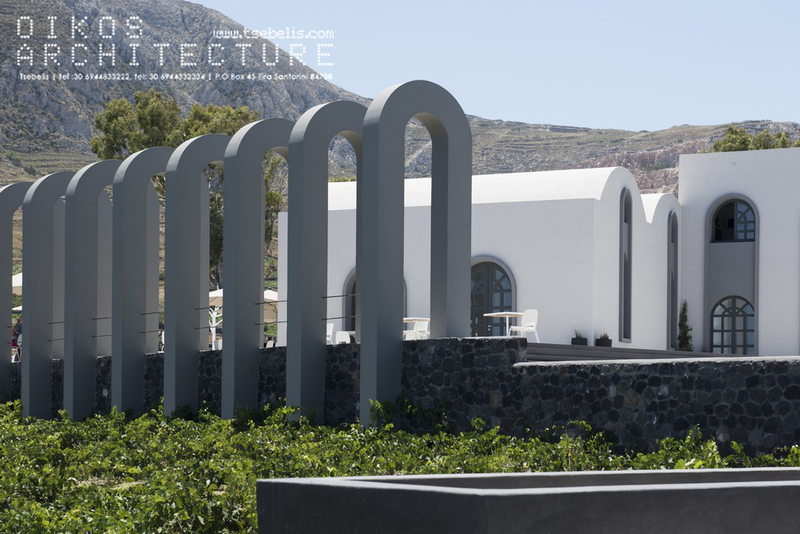 The landscape, which still bears witness of the gigantic volcanic eruption, plays with the building creating a solid dialogue. 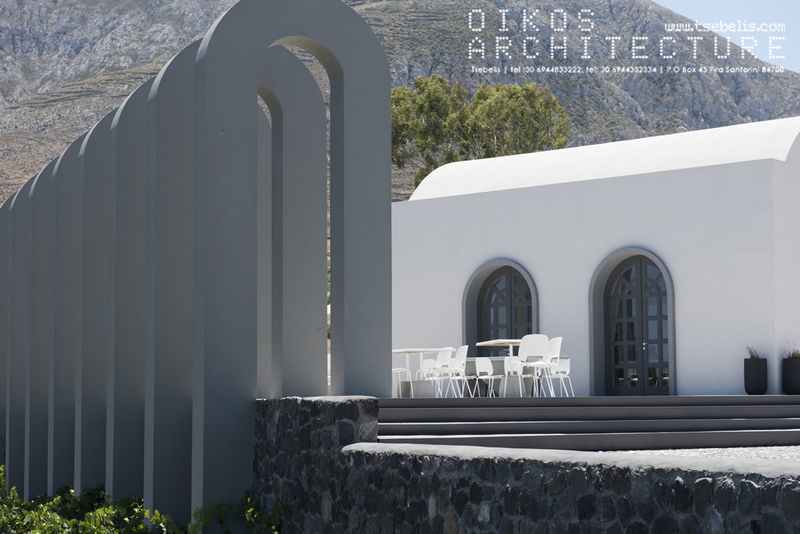 At the bottom of the renovation there is the strict respect of the natural beauty and uniqueness of the landscape of Santorini, which was generated by a massive volcanic eruption. 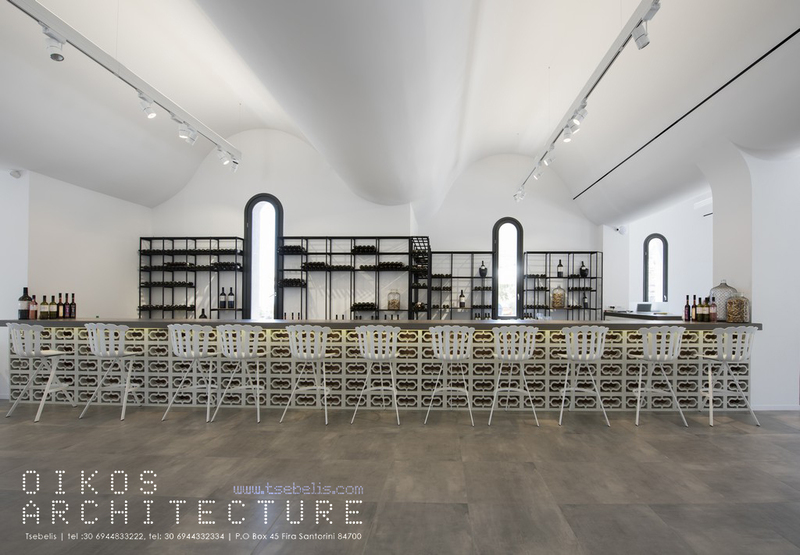 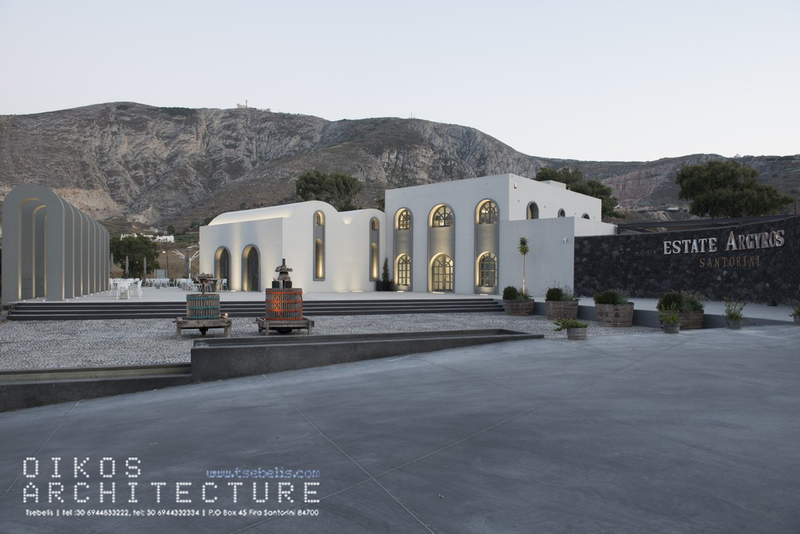 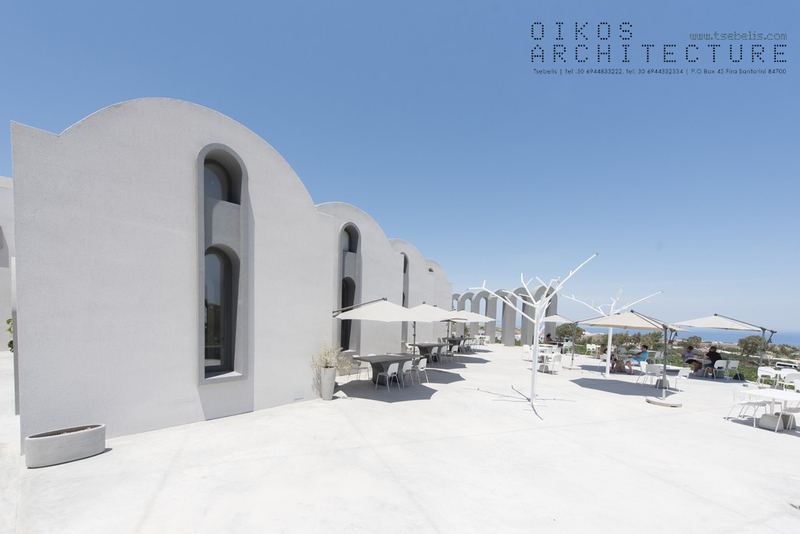 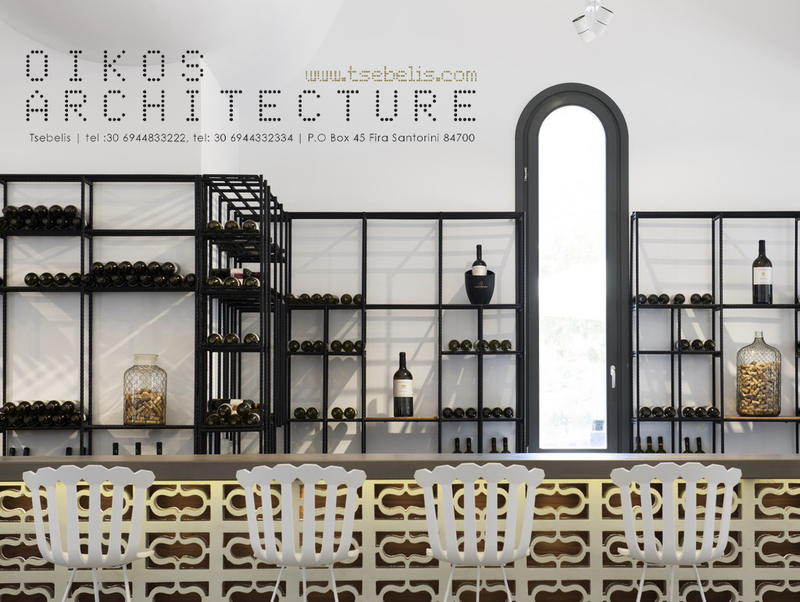 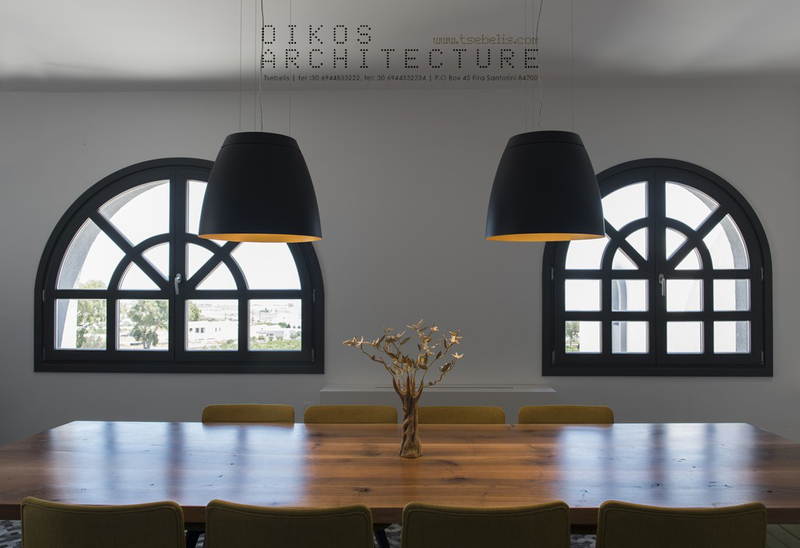 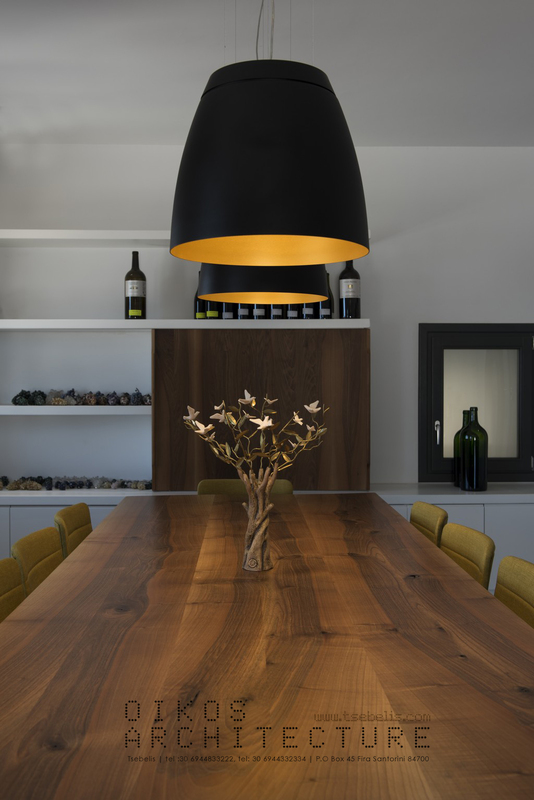 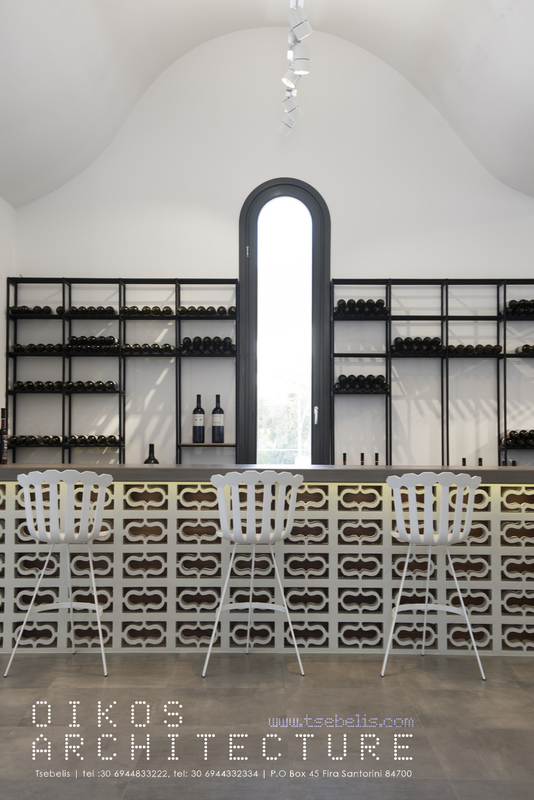 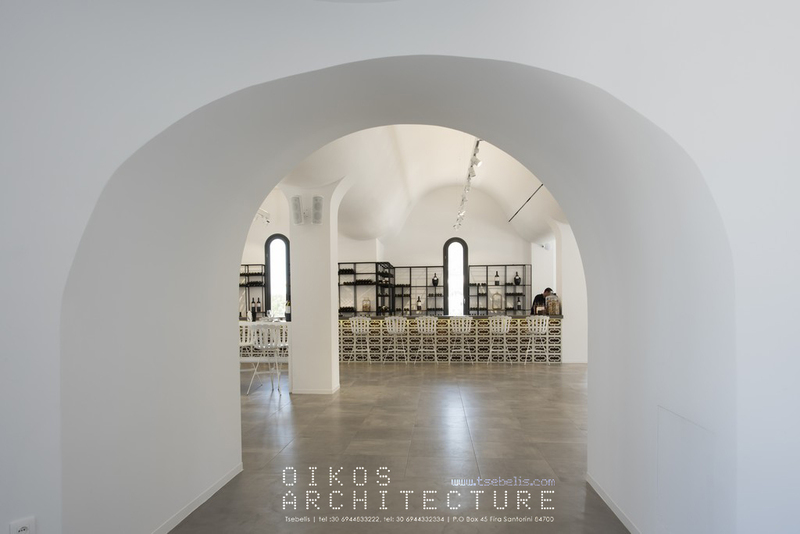 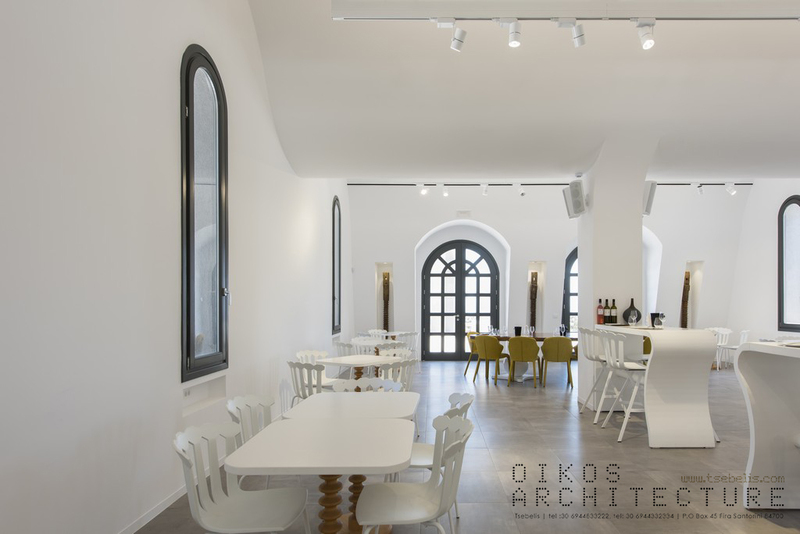 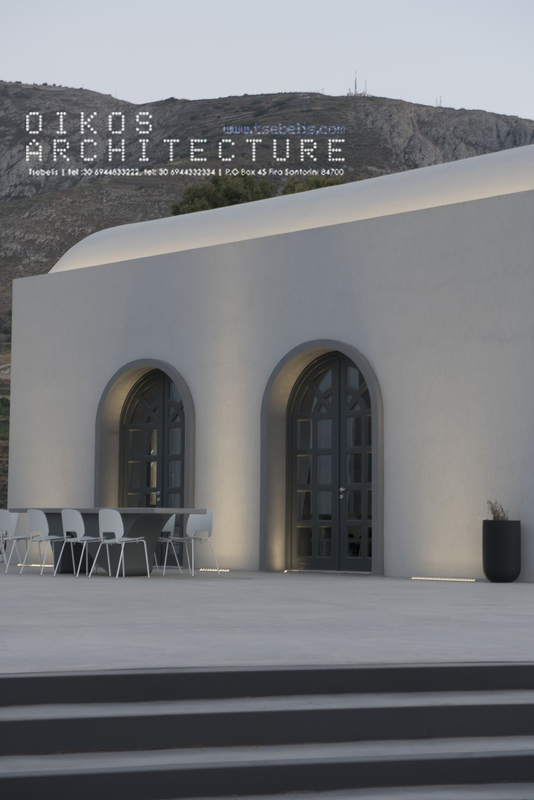 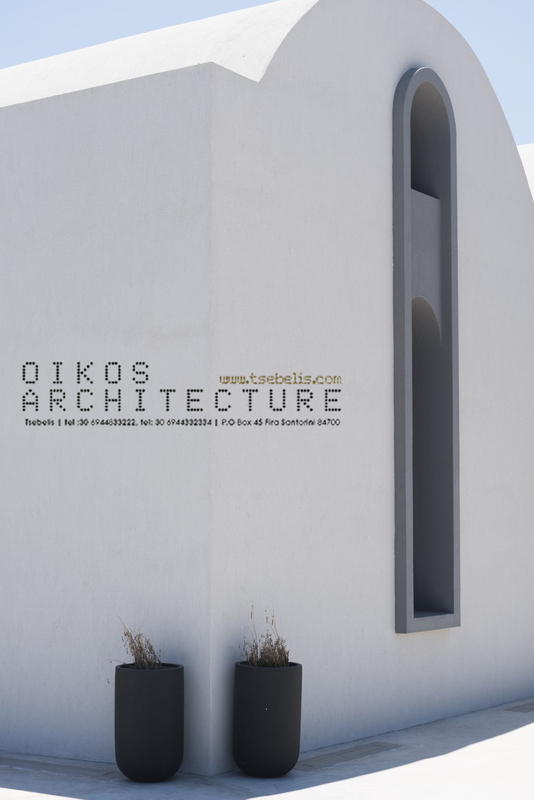 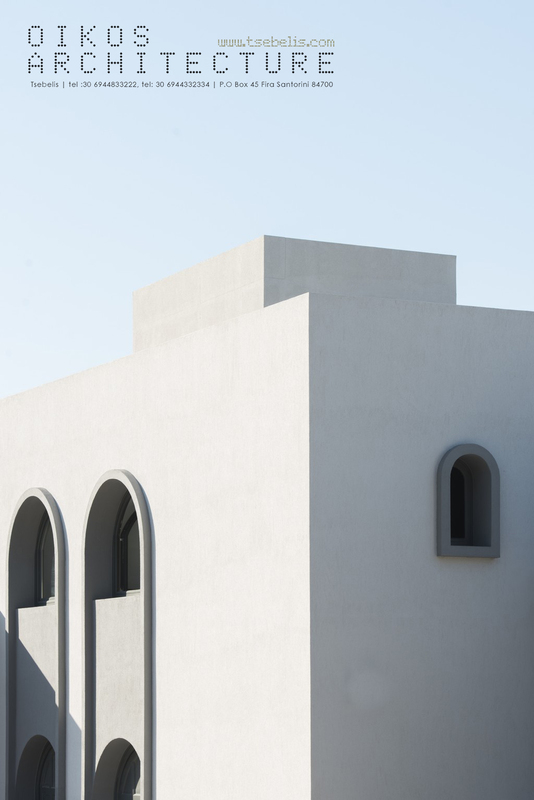 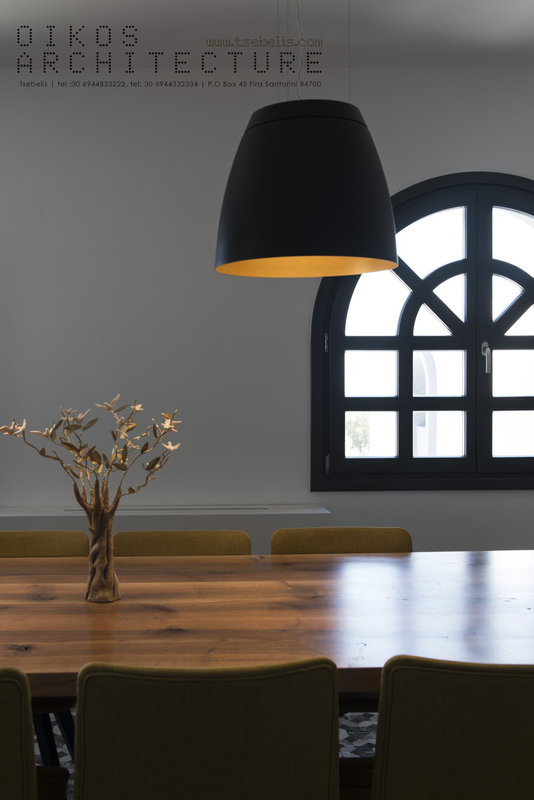 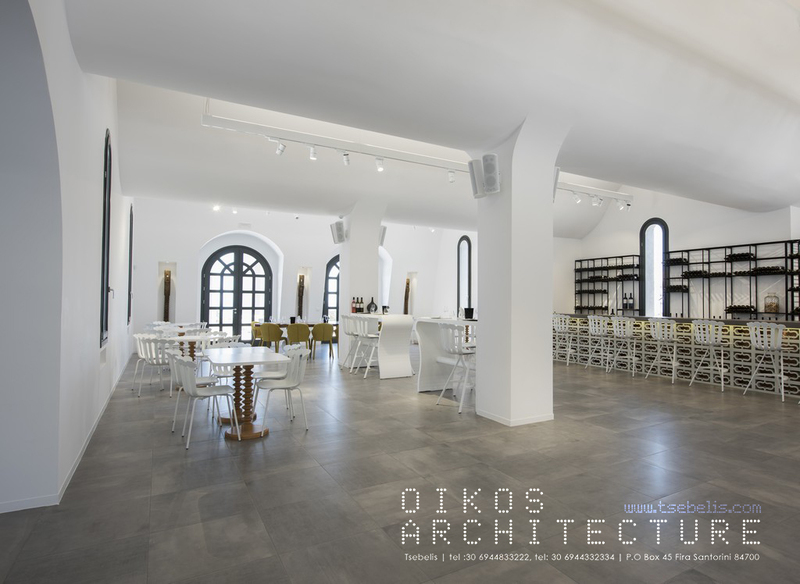 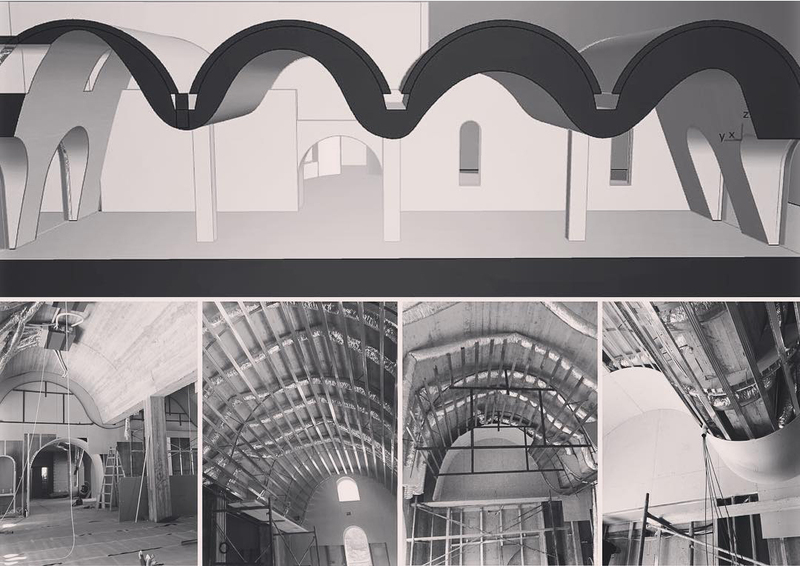 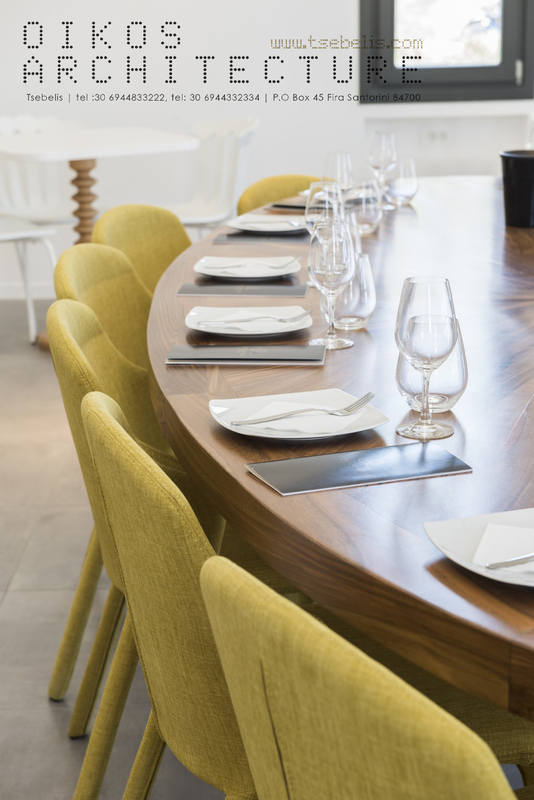 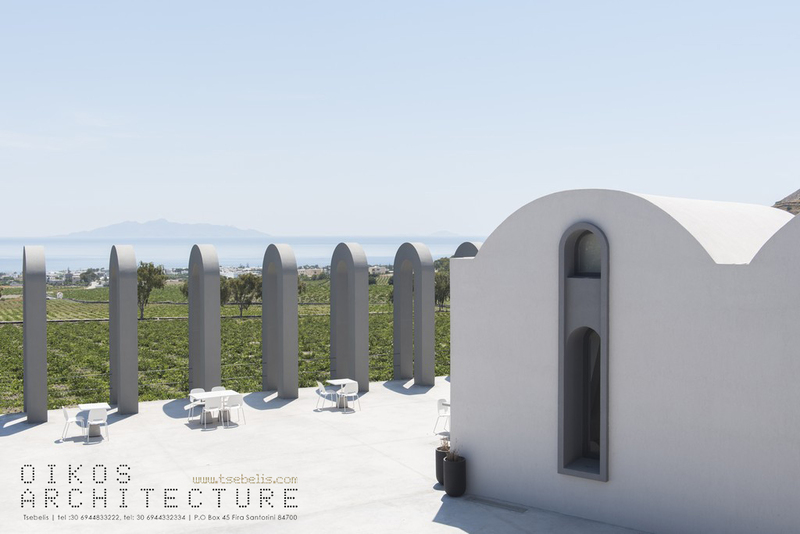 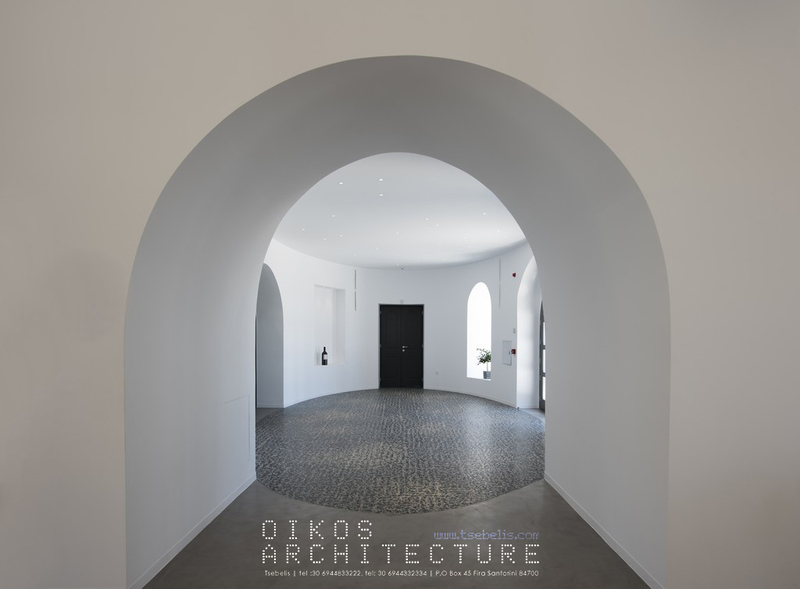 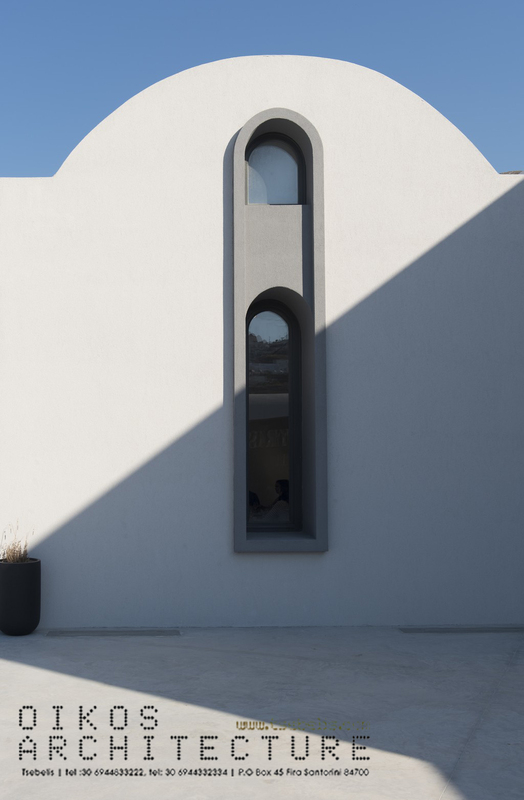 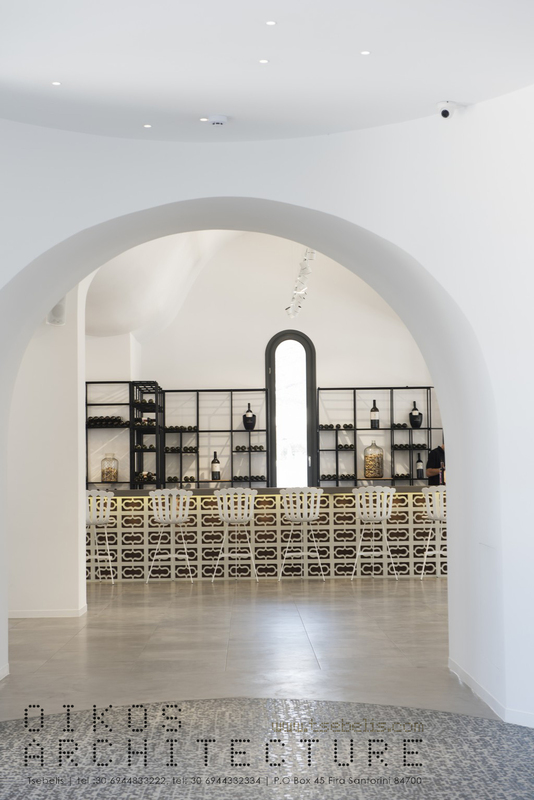 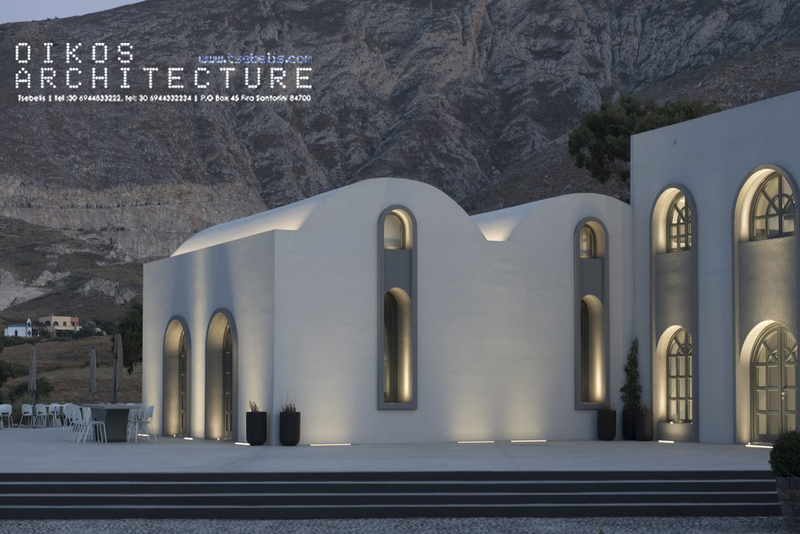 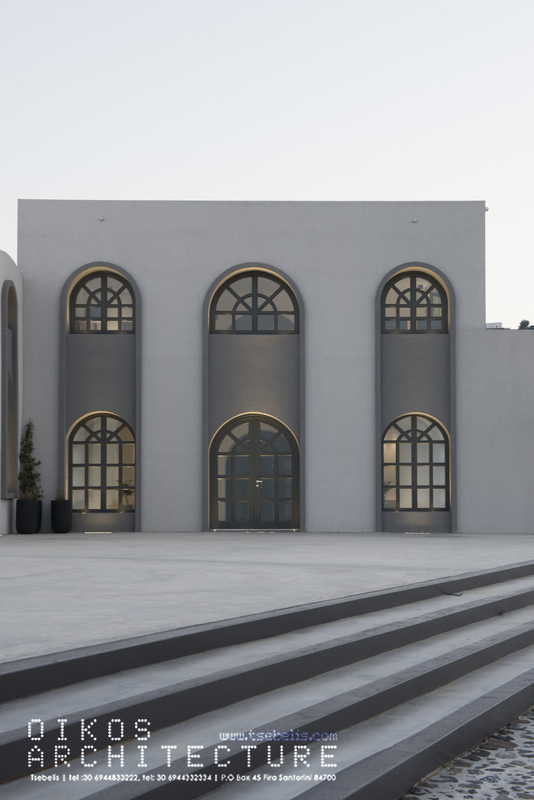 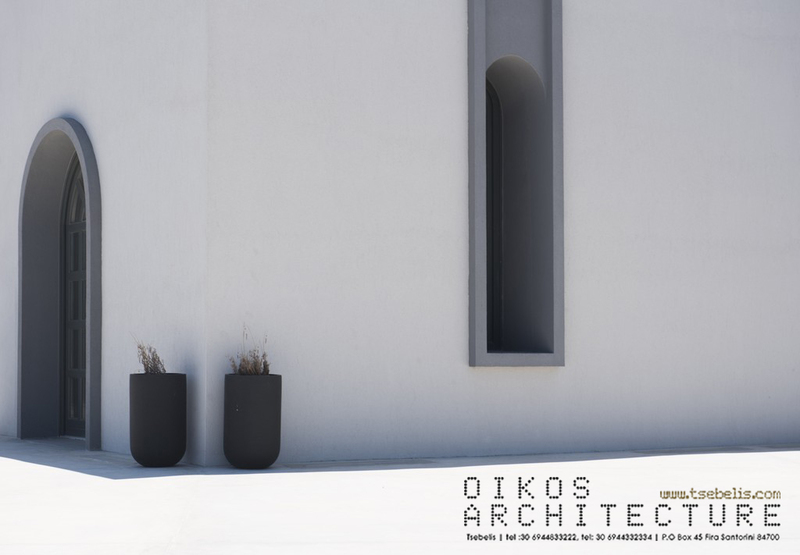 Highlighting the tradition of the island and combining it with a modern design, this was the concept at the base of the design process that Oikos Architecture put in place for the renovation of Estate Argyros, a new winery premise in Episkopi Gonia. 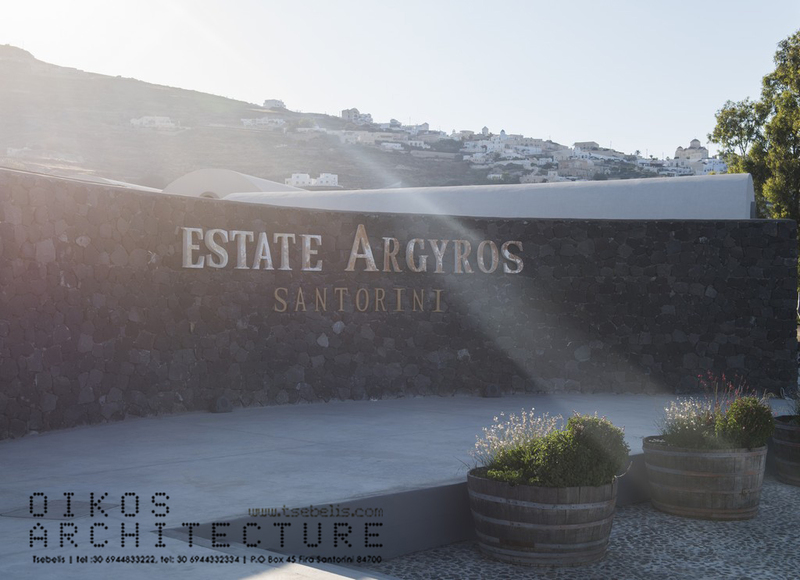 Established in 1903, Estate Argyros is run today by Matthew Argyros, 4th generation of winemaking and 8th generation of viniculture. 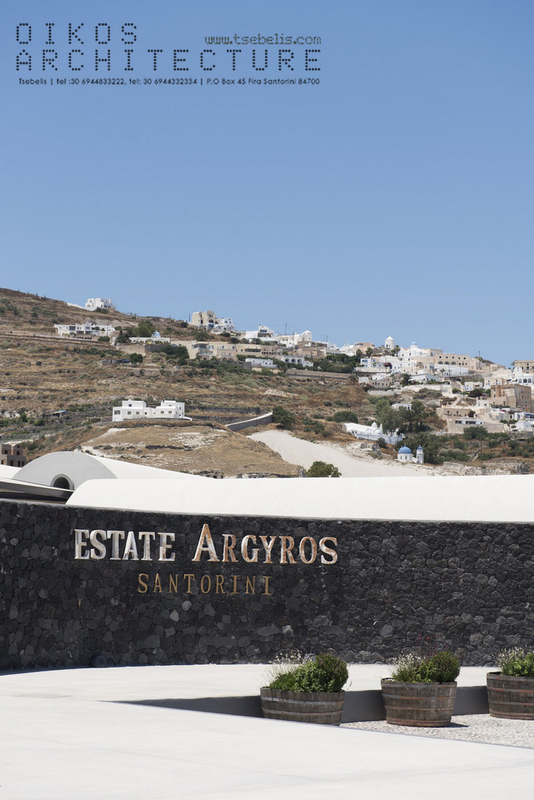 The construction of Estate Argyros was accomplished in 2016. 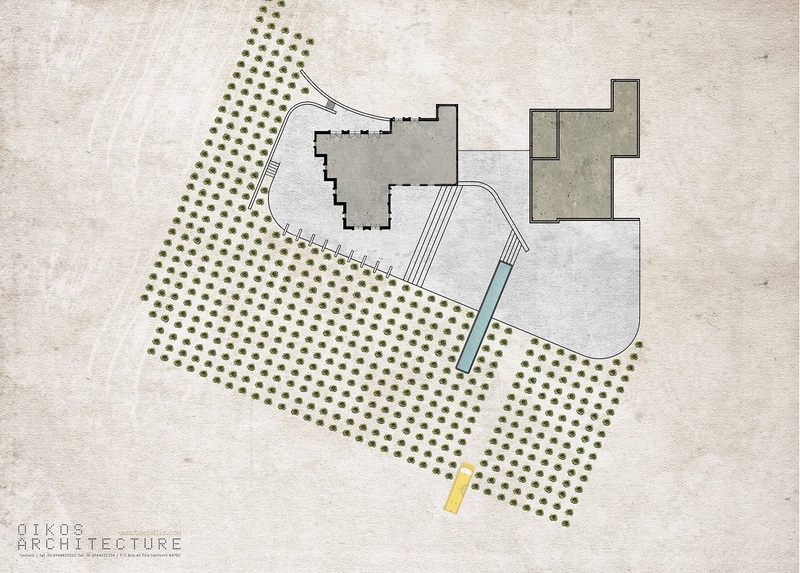 It consists of a wine tasting hall, an office area, the chemical lab and the cellars area. 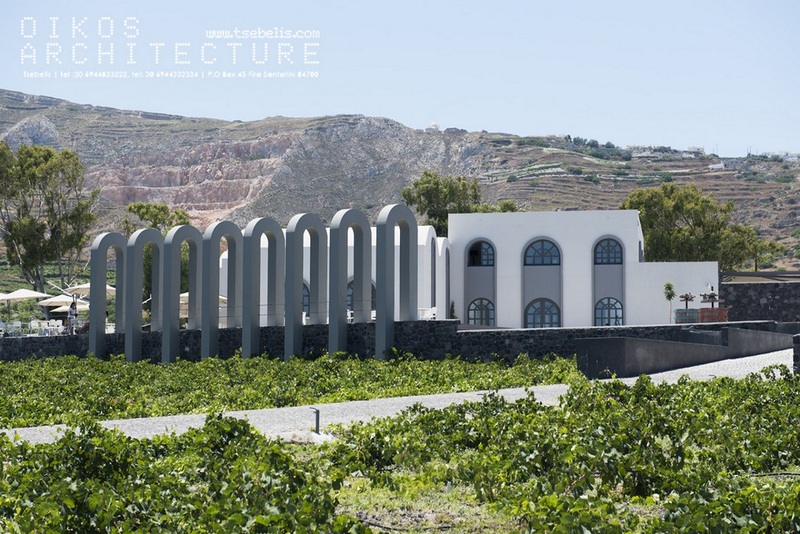 The building is surrounded by 42ha of vineyards which includes also some over 150 years old vines, the oldest in Santorini. 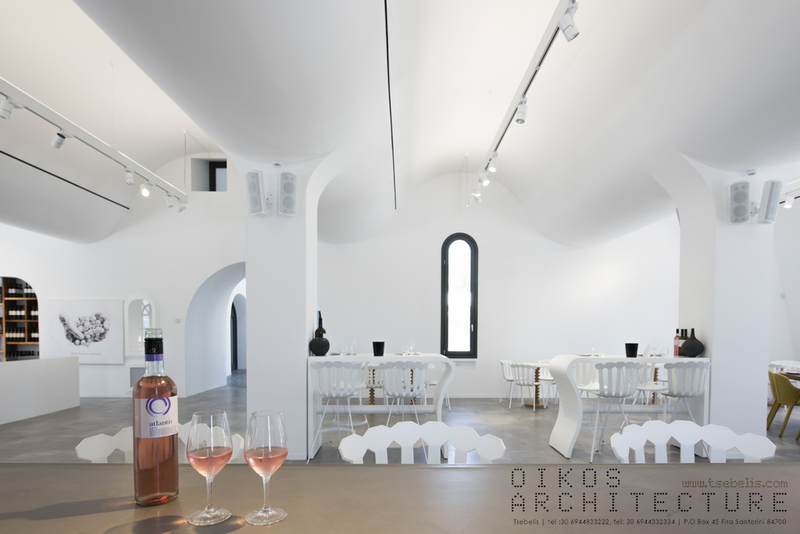 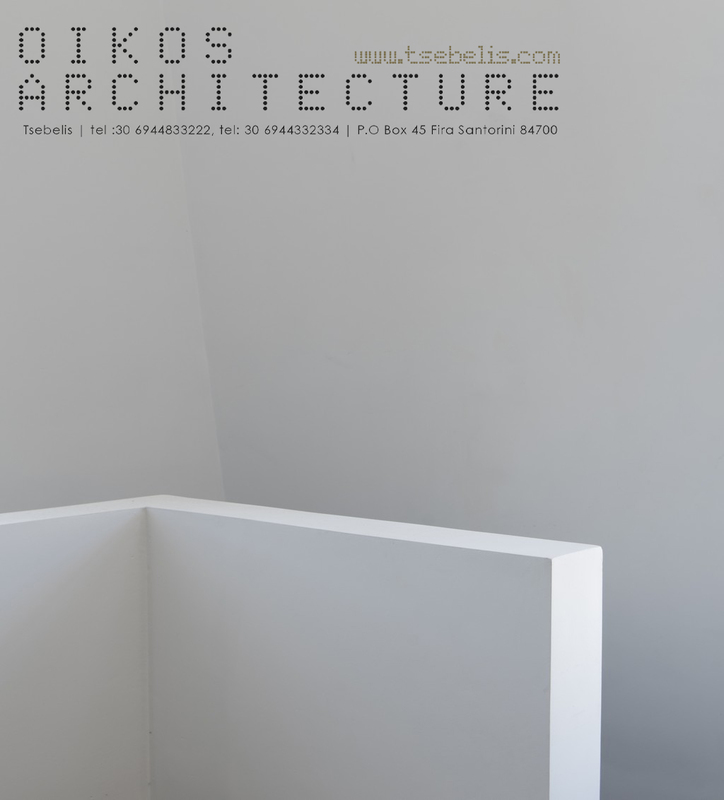 Oikos Architecture took over the project when the bearing structure of the new winery had been already completed. 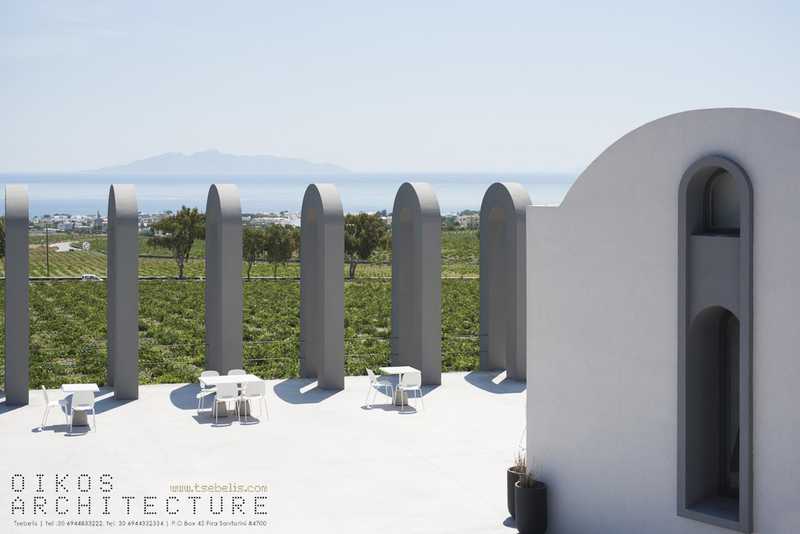 The architects had to solve an issue with the wrong orientation of the building: the main concept of the project was to turn the axes of the building towards the sea view and the vineyards. 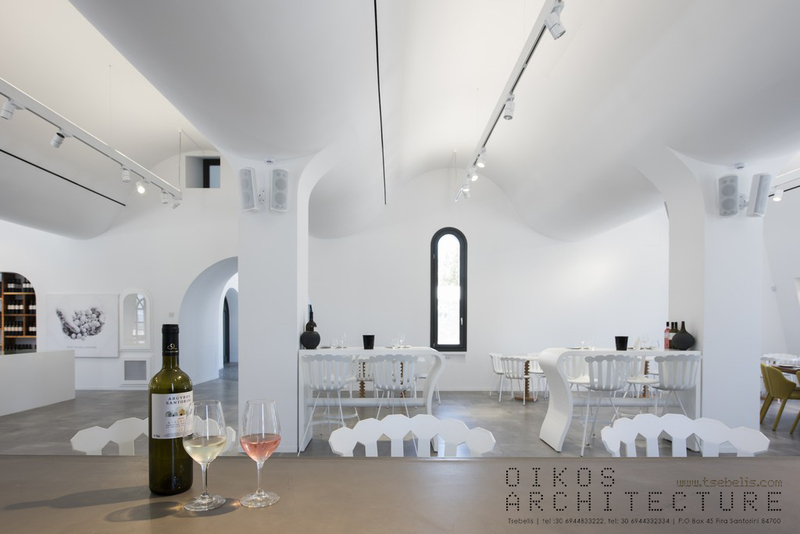 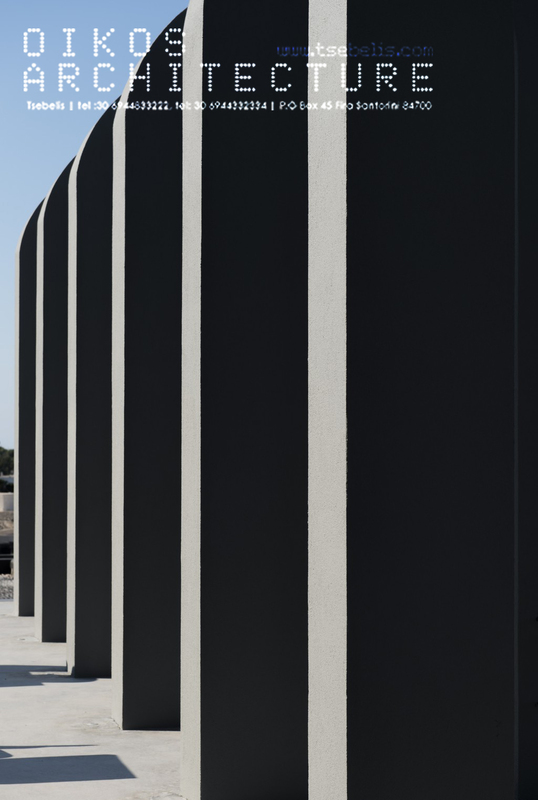 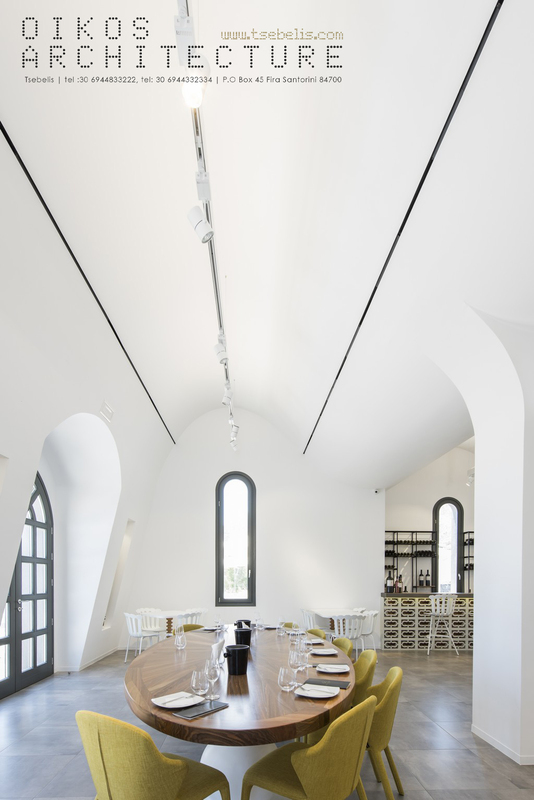 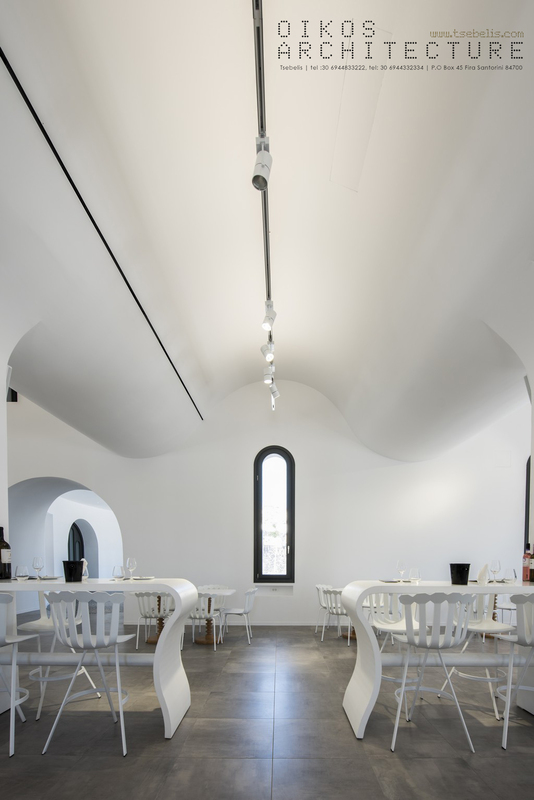 The aim of Oikos Architecture was to conceive the new winery as an extension of the vineyards, a construction which should arise from the perfectly aligned vines. 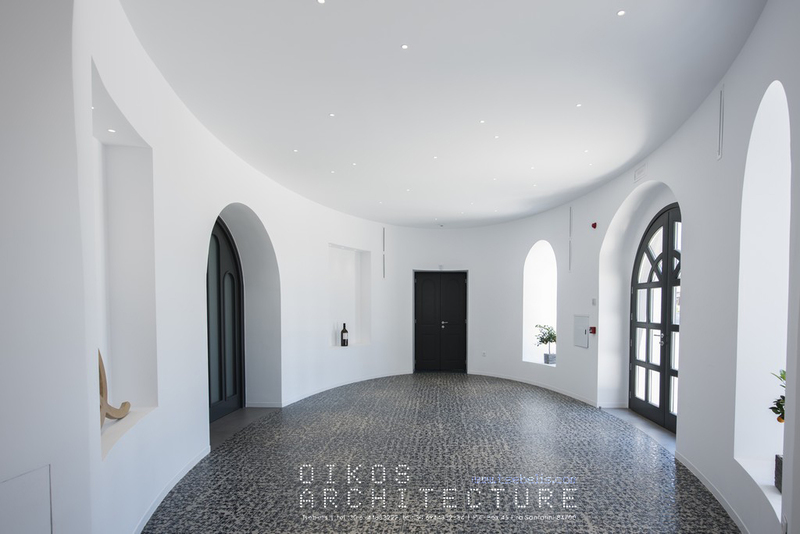 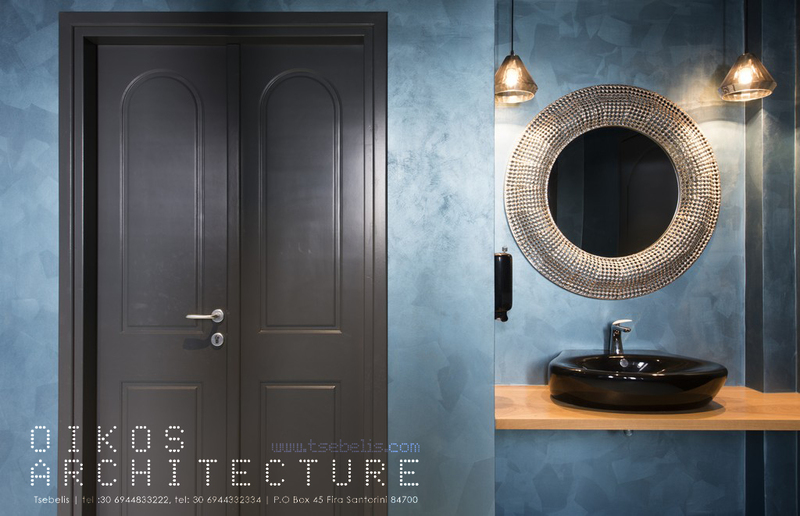 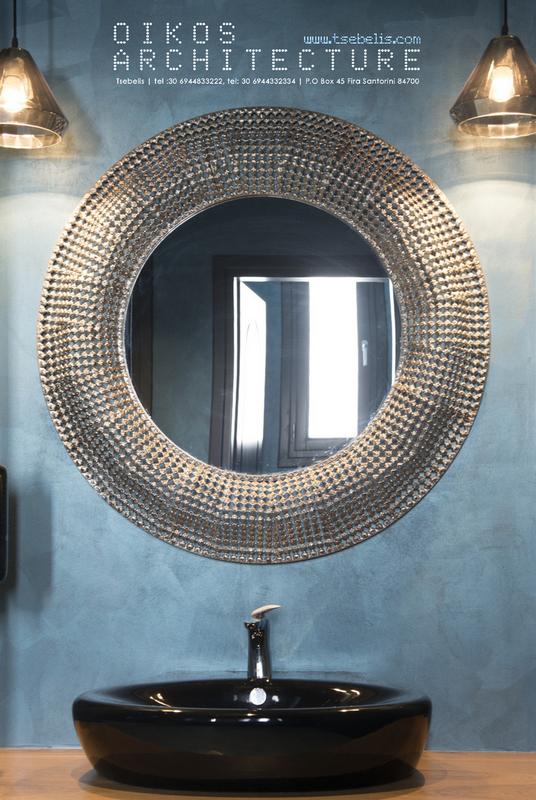 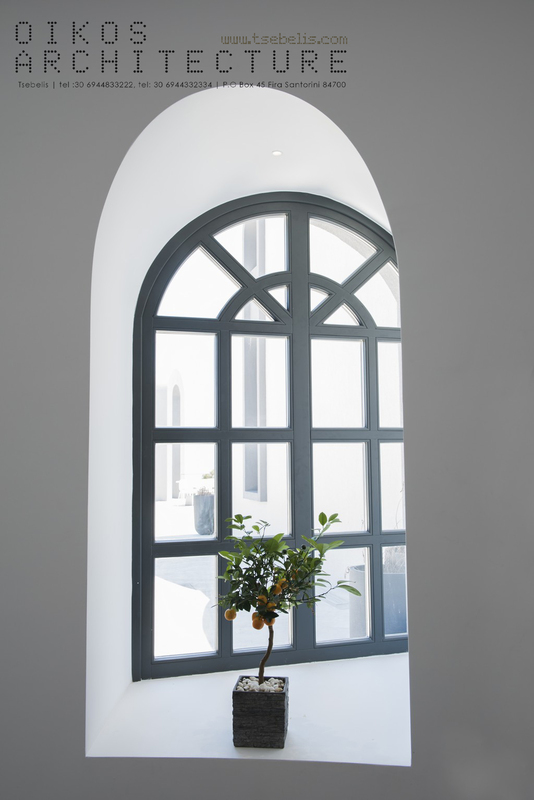 The source of design inspiration was the traditional architecture of Santorini: vaults, arched windows, solid volumes, niches, thick masonry walls with small openings, the whitewashed plaster skin. 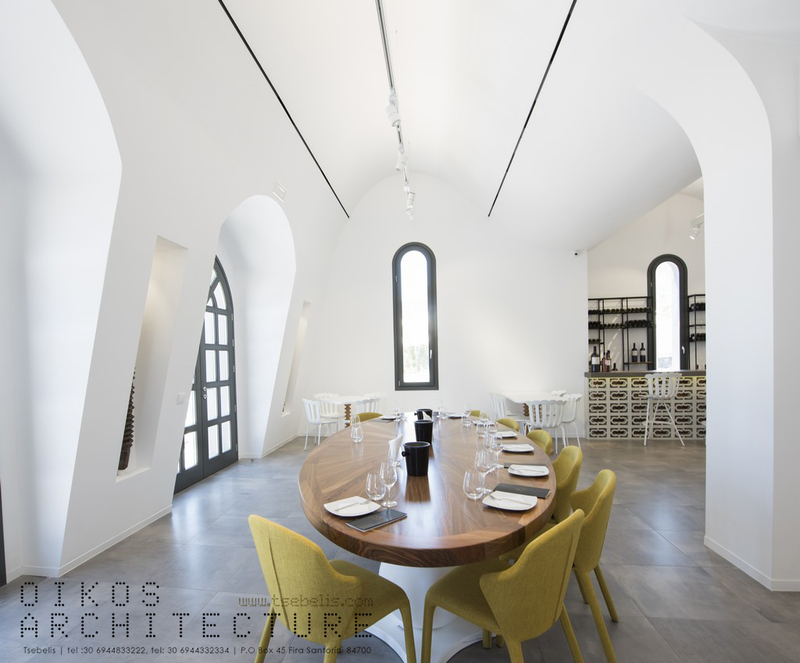 All the traditional architectural elements were deconstructed and reformed in a contemporary way. 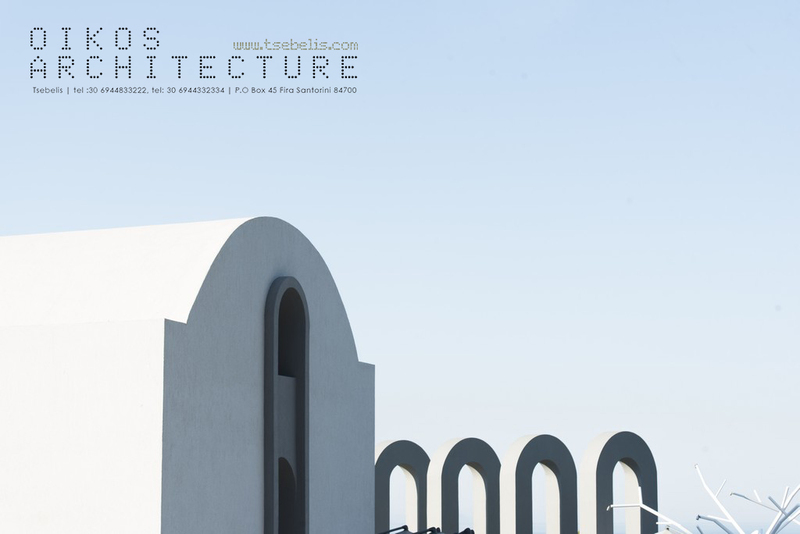 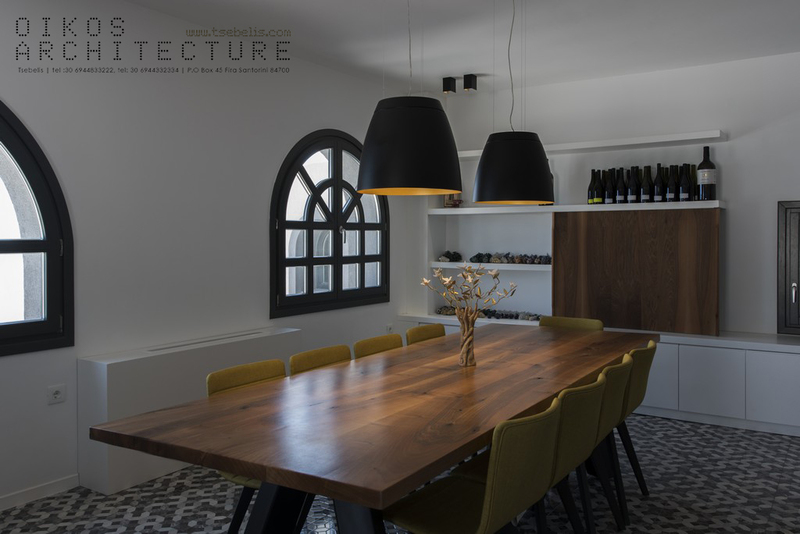 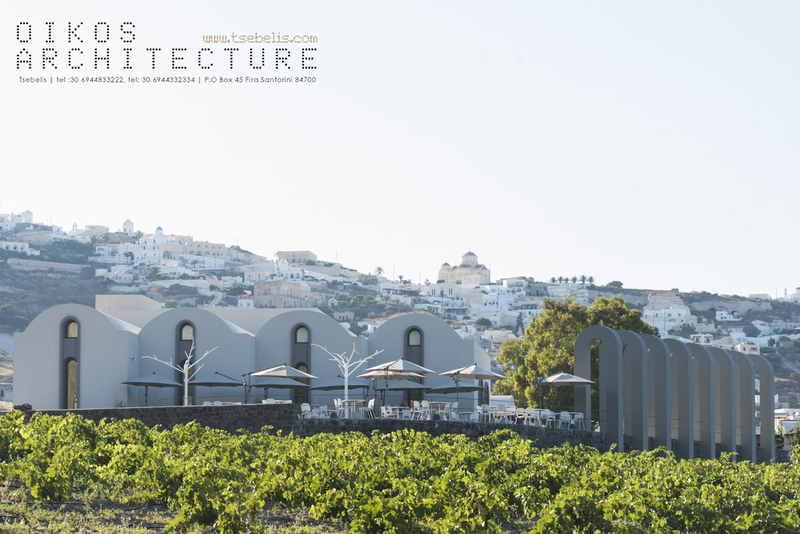 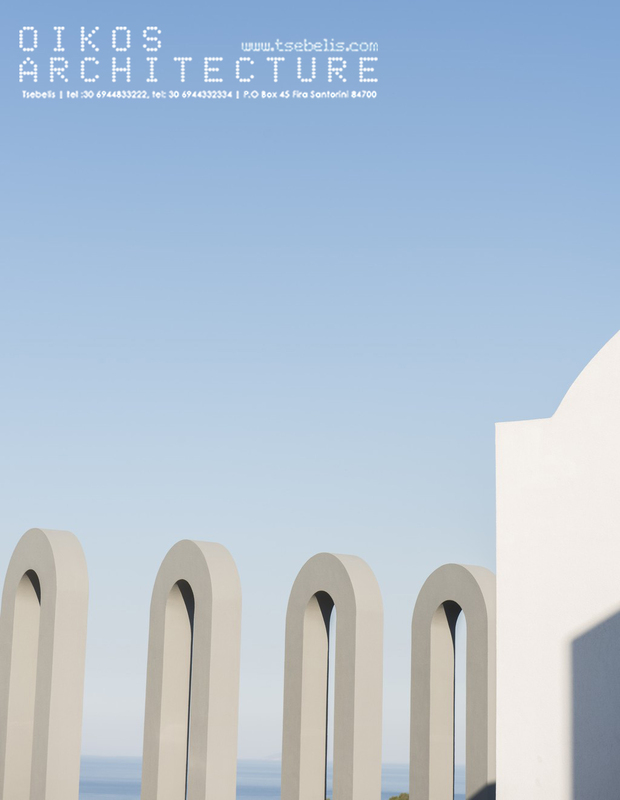 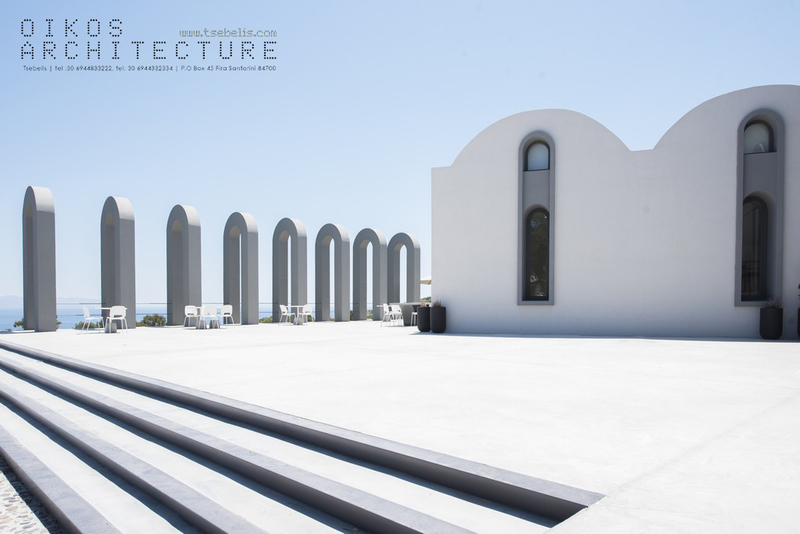 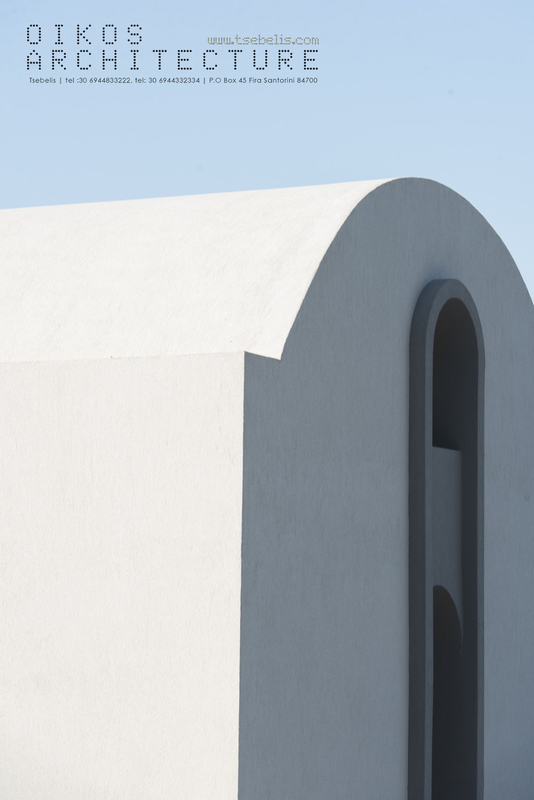 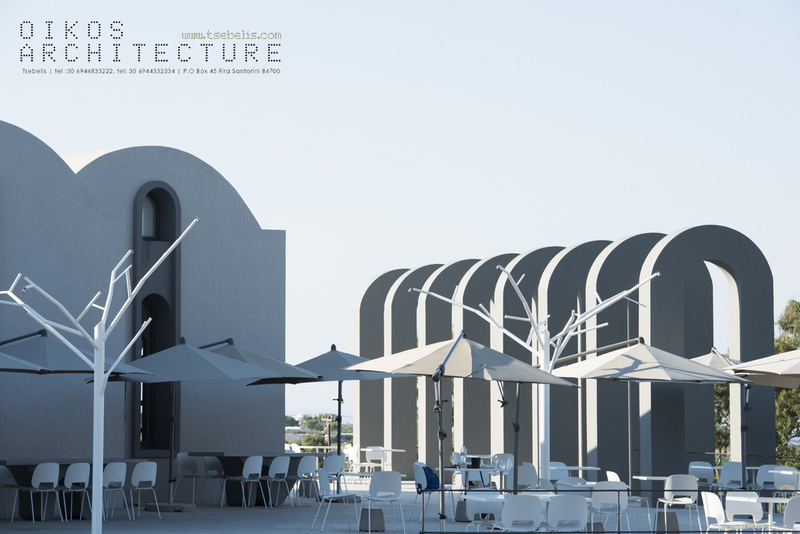 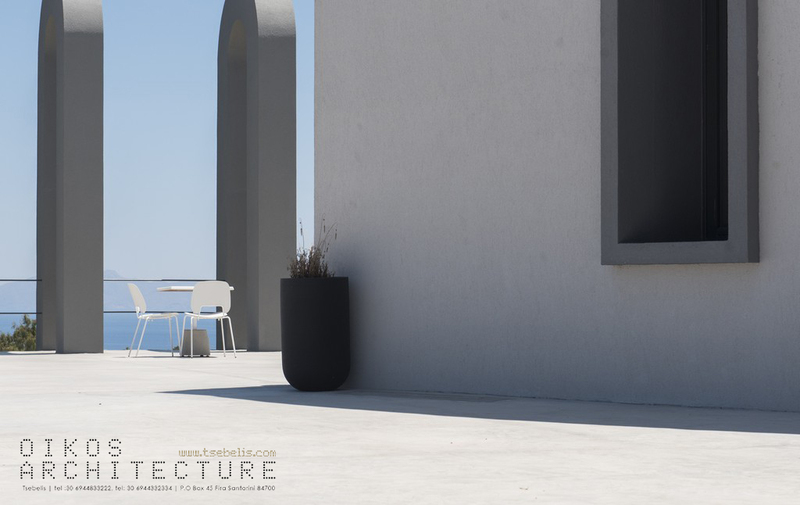 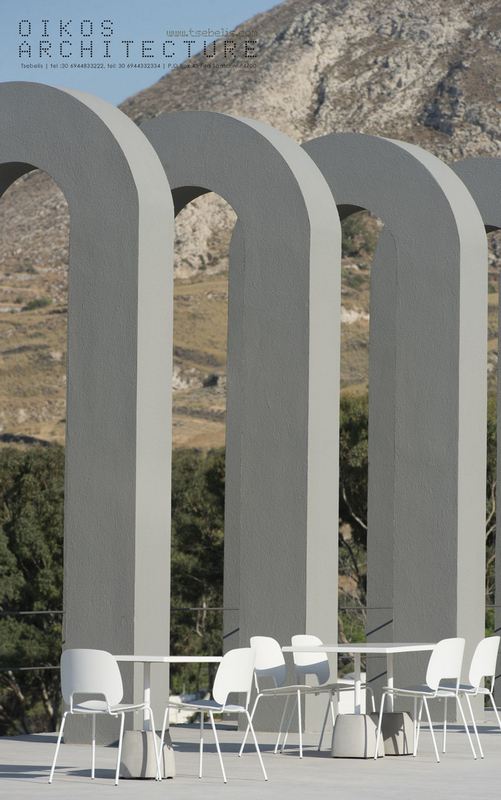 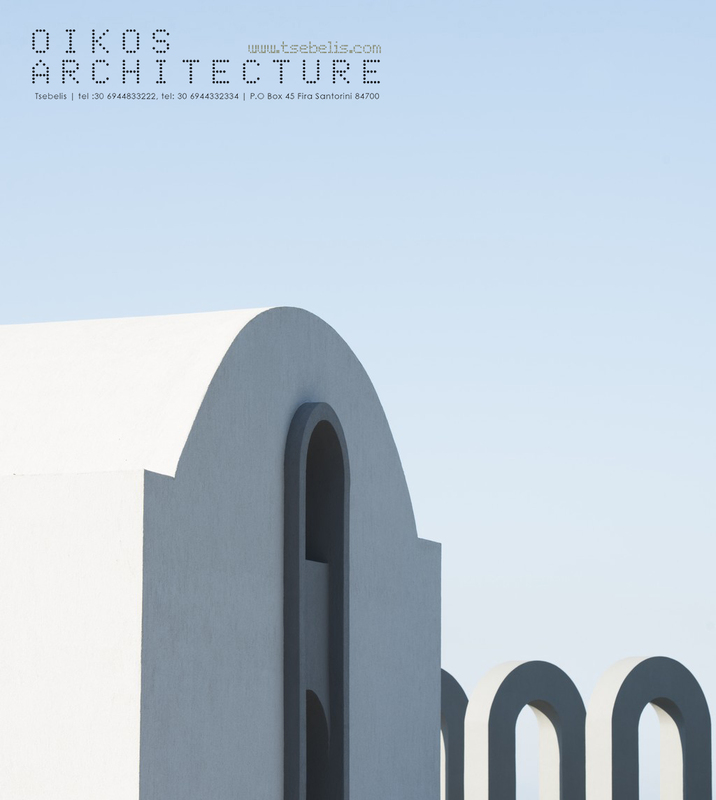 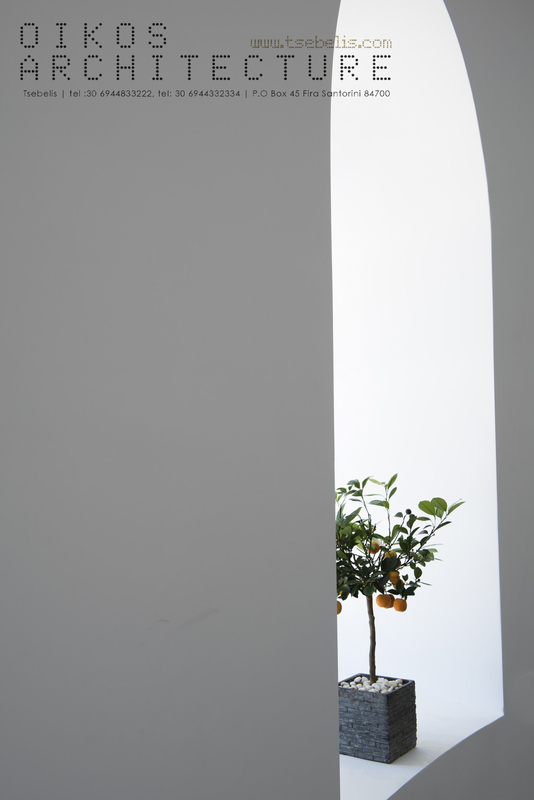 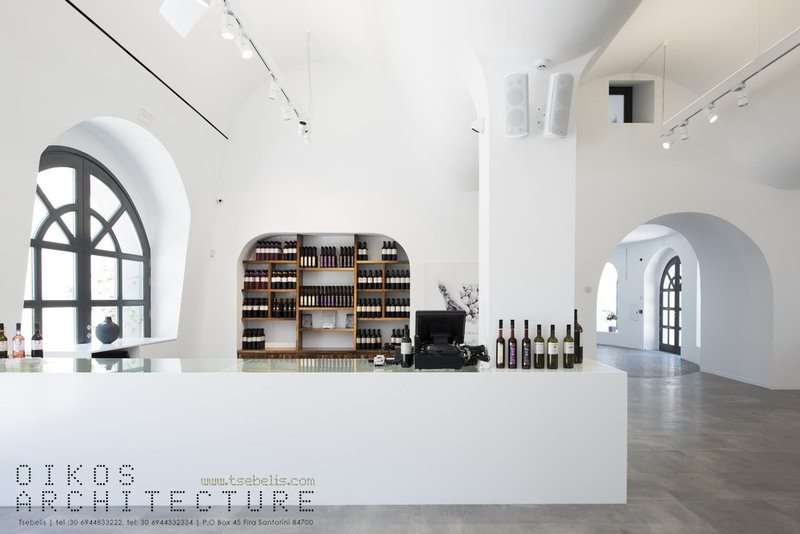 The main design idea and priority was to create a construction in perfect harmony with the stunning natural environment, which should have emerged through the vineyards, characterized by simplicity, plasticity and scale, combining the traditional airy architecture of Santorini with the modern design. 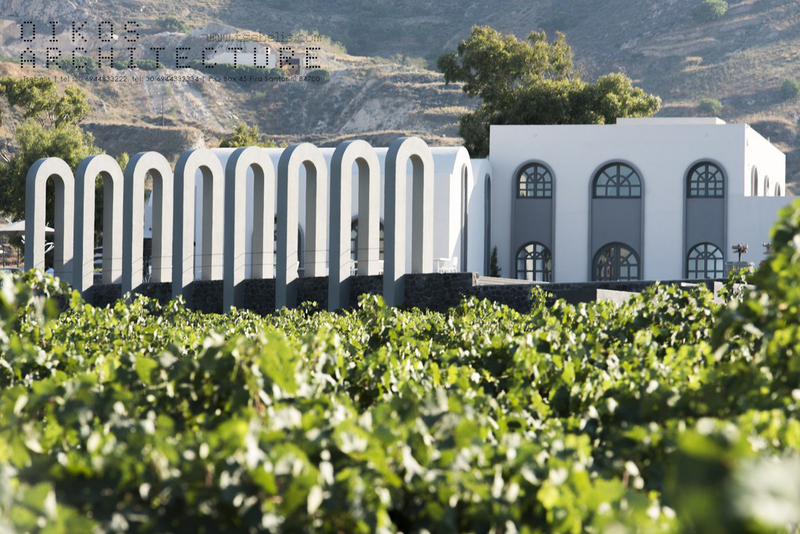 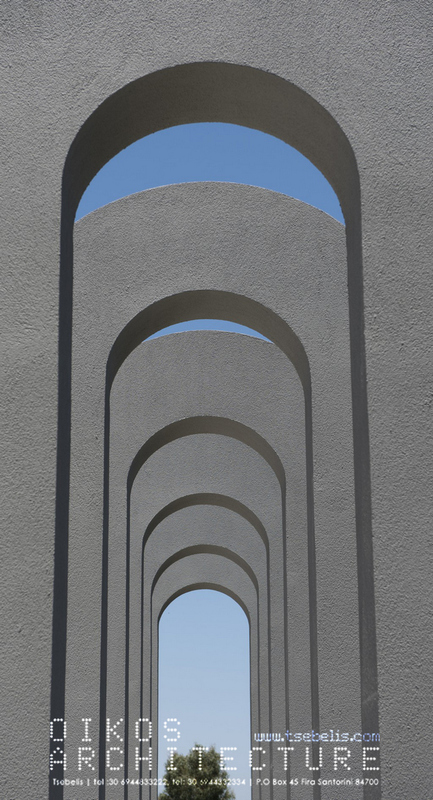 Evidences of the traditional architecture of Santorini are the sequence of the great arches at the entrance orientated to the vineyards, the white, organic, flowing sculpture ceiling at the main wine tasting hall and the grand arched openings. 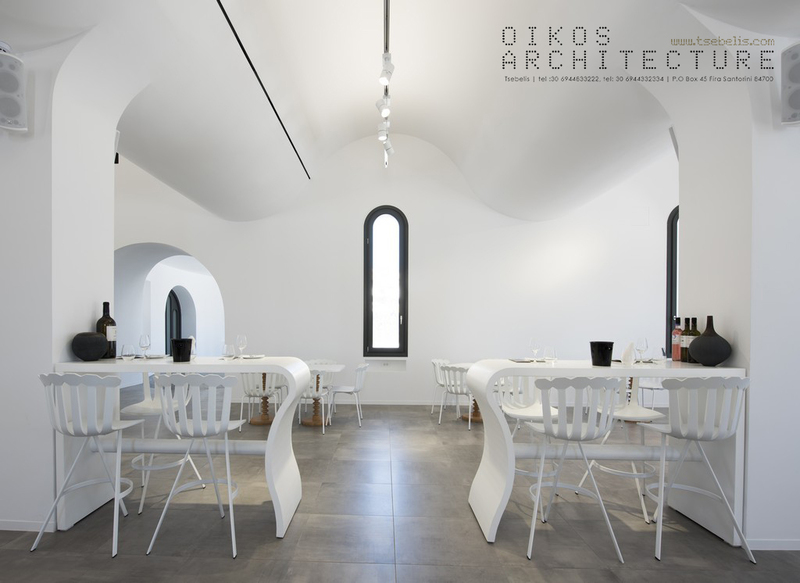 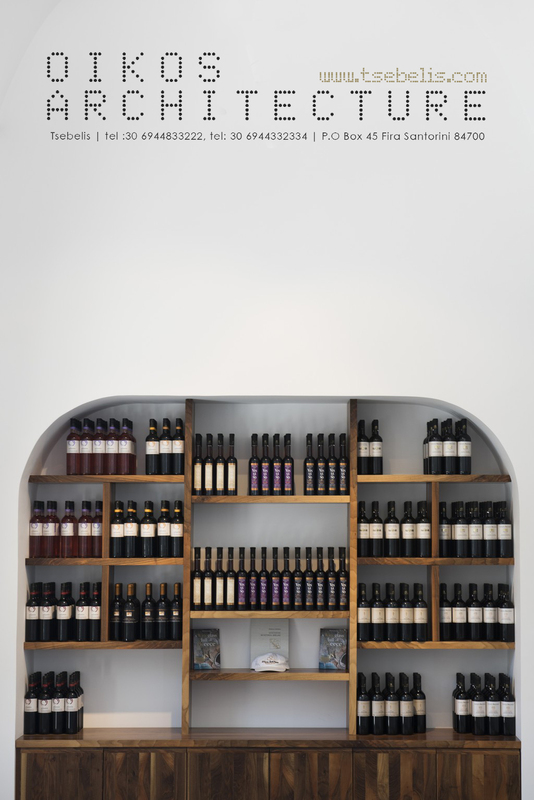 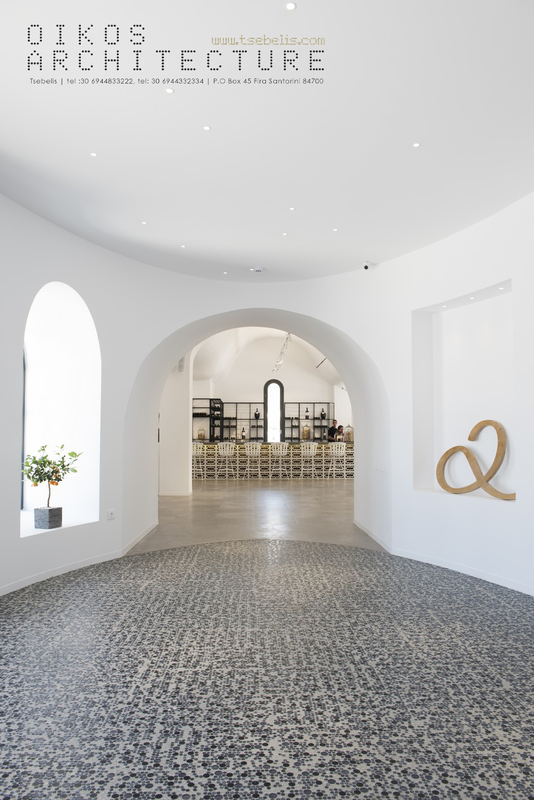 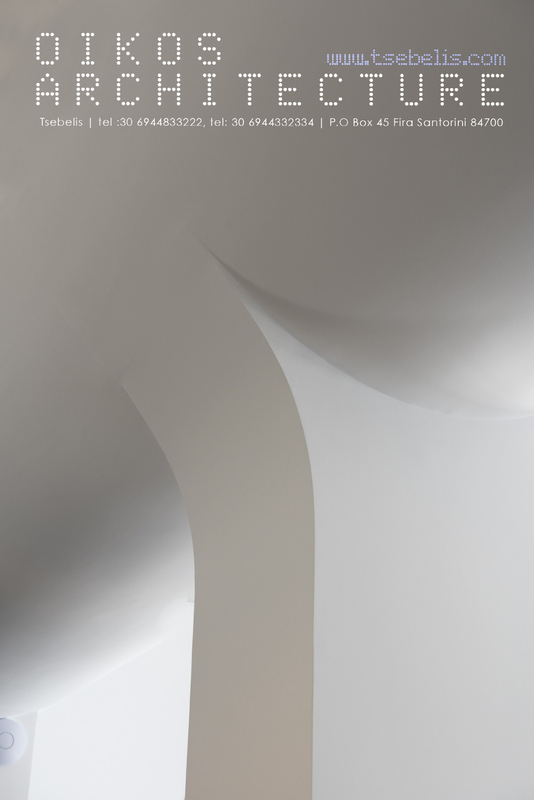 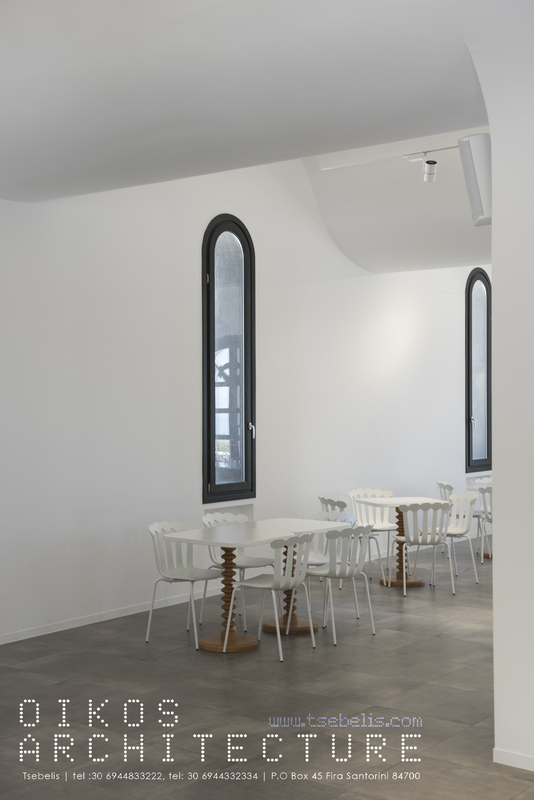 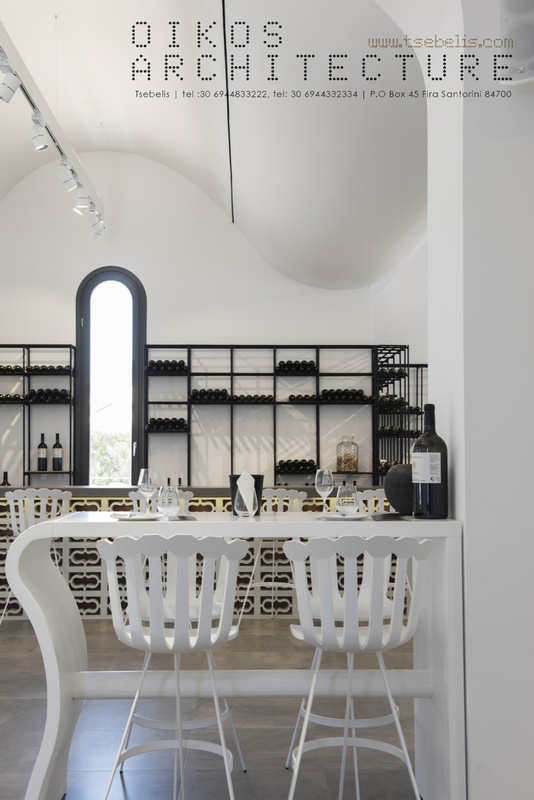 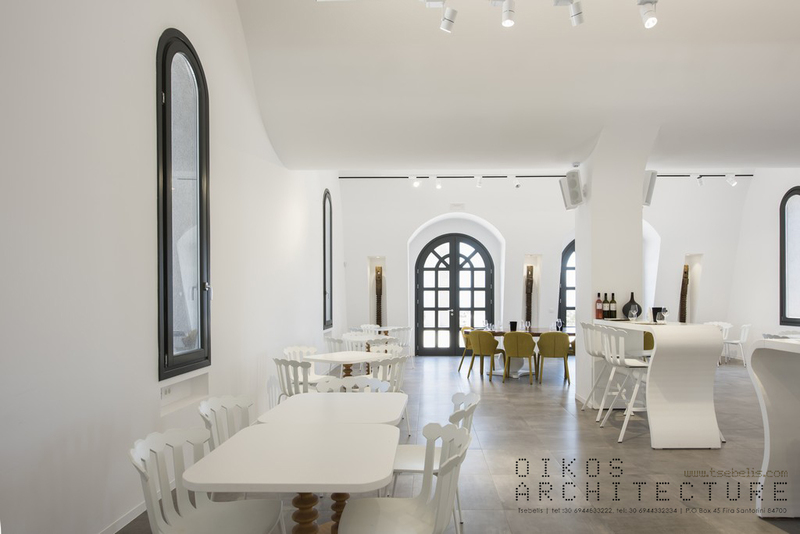 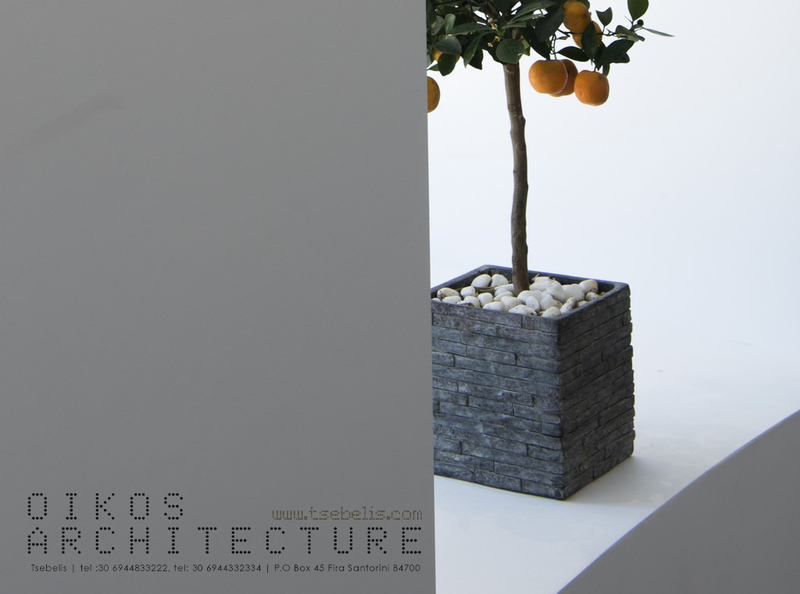 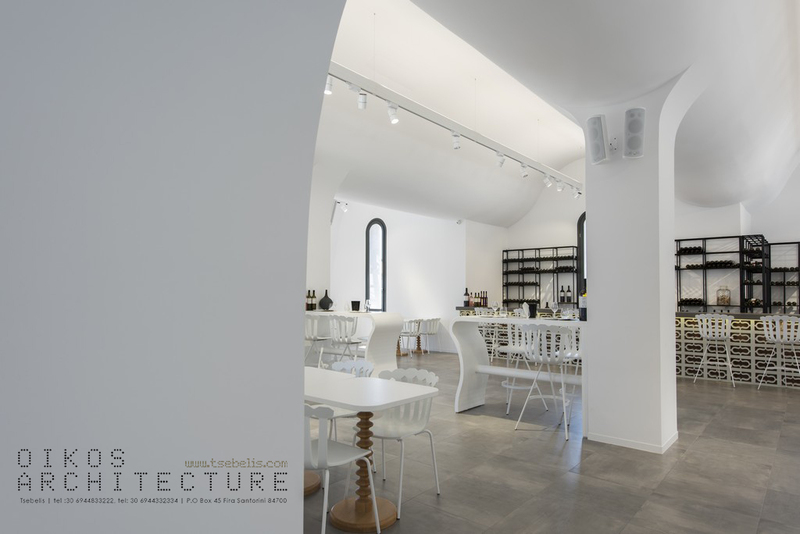 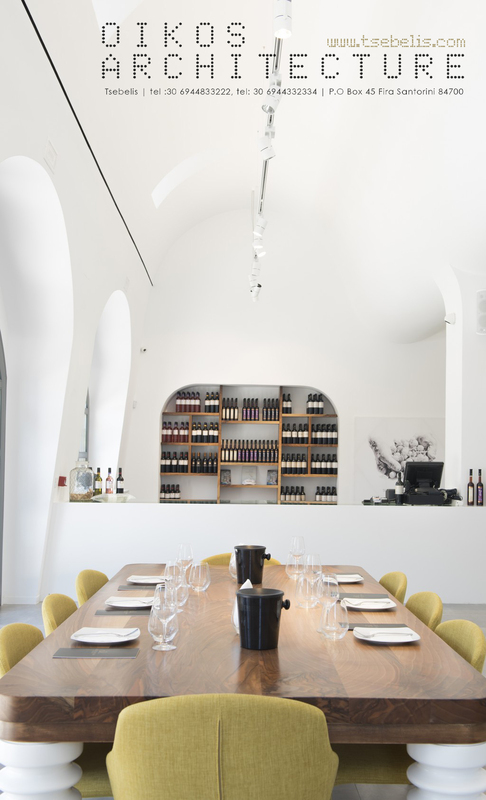 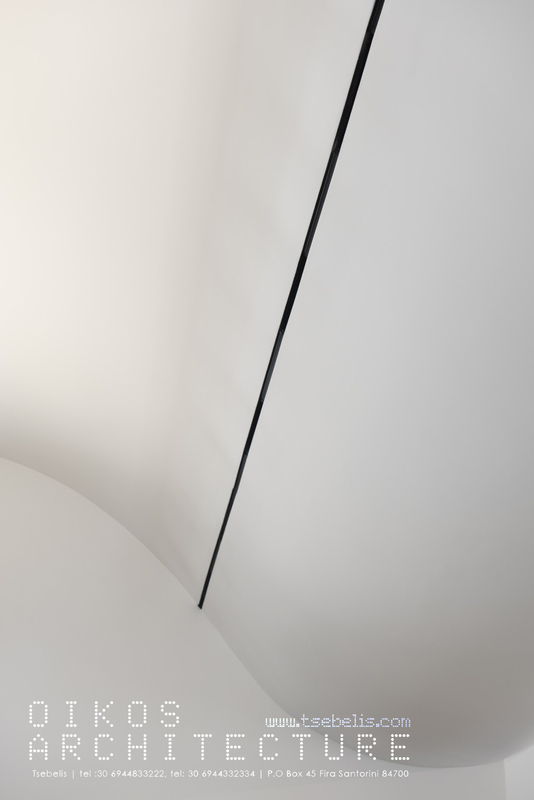 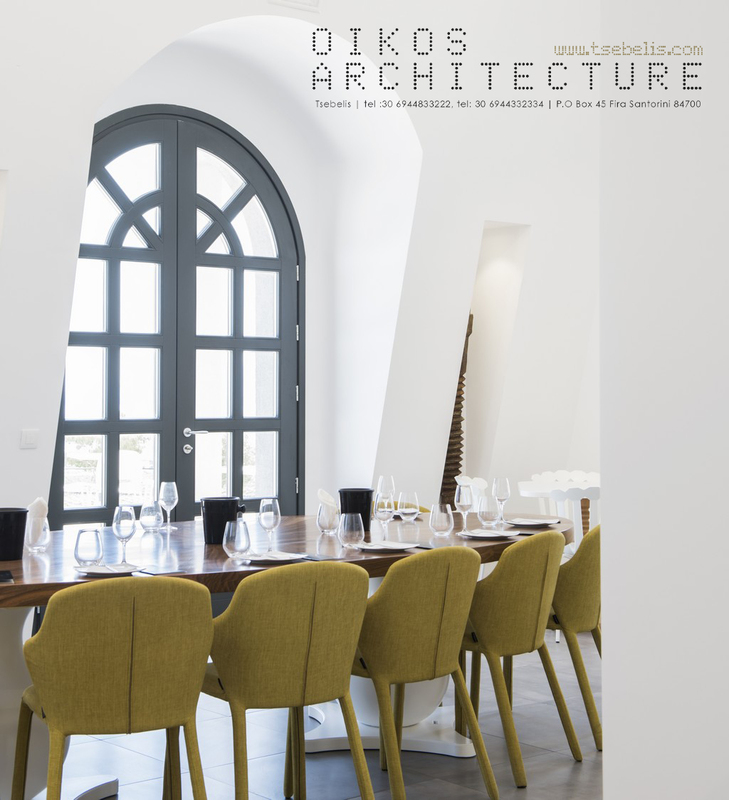 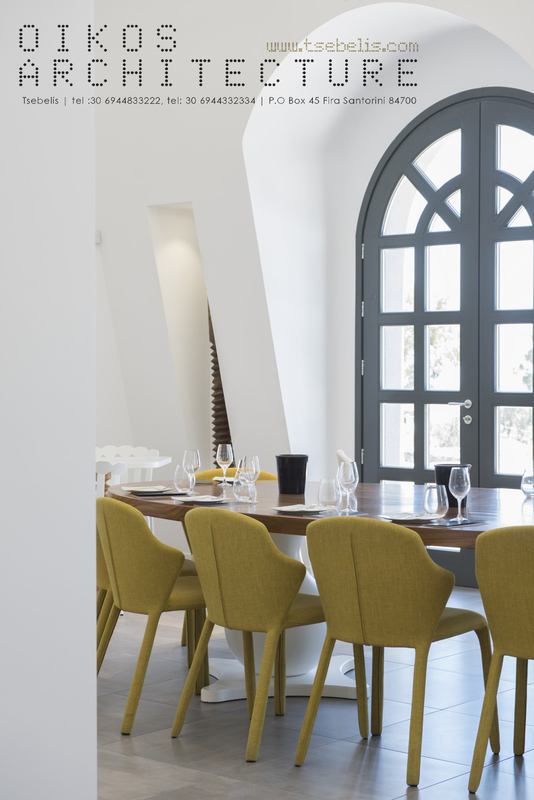 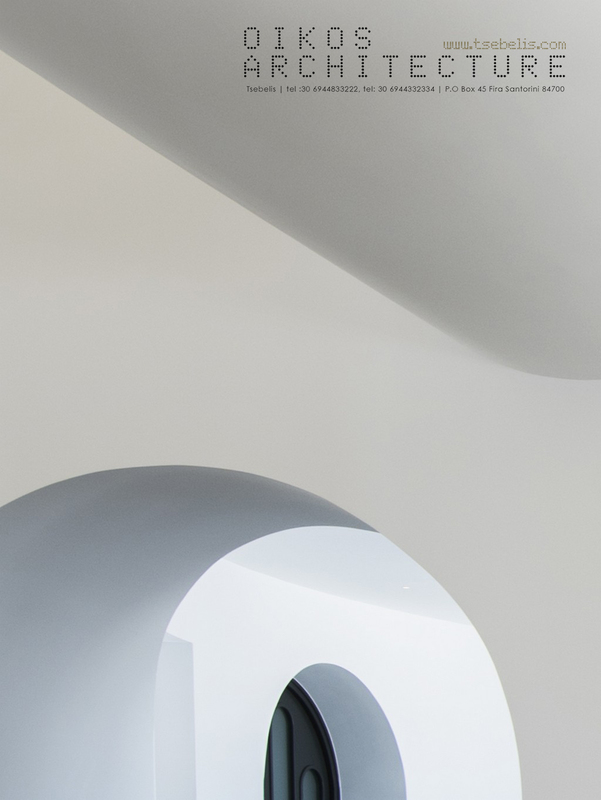 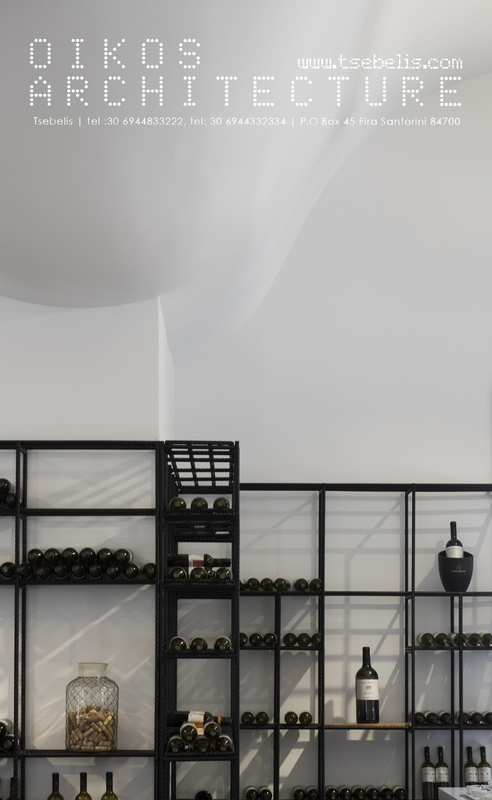 Pure Cycladic white and grey from the stones is the main colors of the interiors of the winery. 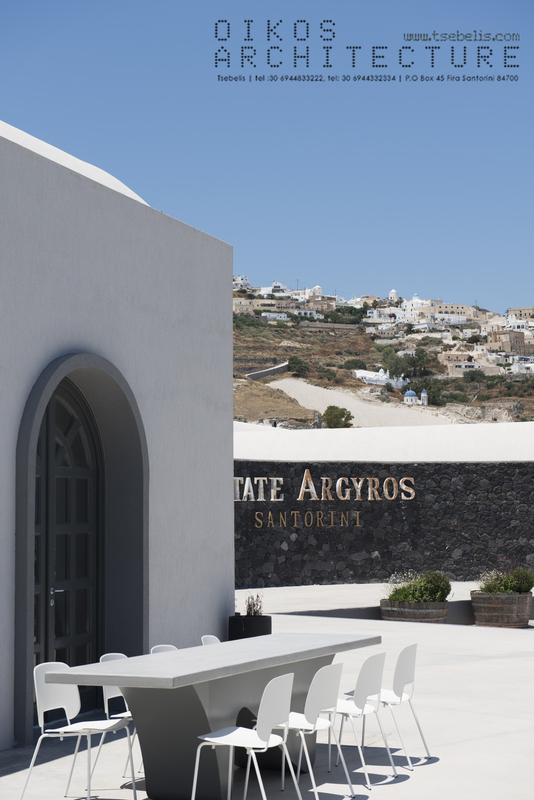 The use of natural materials, warm color palette, elegant furniture with references to traditional elements and a touch of modern design, create a relaxing and sensational ambience indoors and outdoors, ideal for exploring and tasting the indigenous grape varieties in perfect harmony with the unique spirit, eternal beauty and energy of authentic Santorini.